Stampin’ Up! Demonstrator Pootles – Ice Cream Colour Doughnuts with Sprinkles on Top! Ice Cream Colour Doughnuts with Sprinkles on Top! I love a stamp set that matches a DSP pack, and this is one that definitely does that. Sprinkles on Top has been designed to coordinate with the Cherry on Top DSP and Washi Tape. But… and this is a big but (! ), I don’t always want to matchy match things. I love the Cherry on Top DSP, but I didn’t want to make a brightly coloured card. I was struggling a little with the colours to choose to use with this stamp set, then a couple of weeks ago (when I made this card! ), we had just had our food delivered and in it, I’d added some doughnuts at random for the boys. I hadn’t paid attention to the ones I’d added to the order and was happily pleased to see that they were Ice Cream flavour. And colour….! The prettiness (and tastiness!) 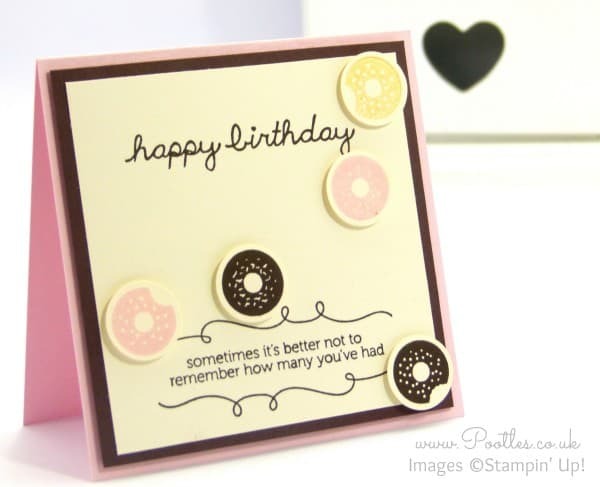 of those doughnuts were the inspiration point for my cute 4×4″ card and I used Chocolate Chip, Pink Pirouette and So Saffron for my doughnuts that I punched with the 3/4″ Circle Punch and scattered on the card. Cute and simple and totally inspired by foodie stuffs! Sam I love your video tutorials, I could watch them all day long, loved the 6×6 week, such brilliant ideas! Looking forward to the Christmas ideas! 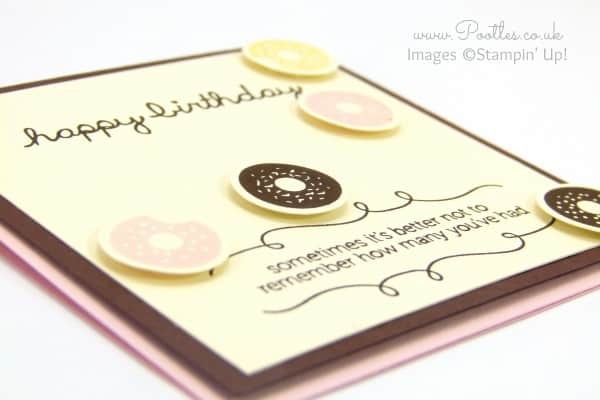 Super cute card, perfect for a doughnut lover like me, LOL!! The sentiment is so darn true, whether is for birthdays or doughnuts, tee hee!! !